CC It’s a flower stand that I have on my top floor landing. I found it in the flea market in Vienna last May. I had travelled alone to Vienna after a long-term creative role in Paris ended suddenly. I needed to re-energise, rest and be inspired. It felt perfect that I found something for flowers. It’s the first thing I see every morning and I adore it. It sits under a collage by Linder that I bought at her Tate St Ives show, a paper collage of a 1930s couture model with a seashell in place of a hairdo, I really hope Koloman Moser would have approved of the juxtaposition. GB How did you first become interested in the Secessionists? CC As a teenager I loved the music and image of bands such as Adam and the Ants, Bow Wow Wow, Southern Death Cult etc. I adored how their Burundi rhythms, pirates and Navajo stolen from other cultures transported me to a world beyond my own. My parents were living in Hull and I started shopping at the Victorian arcades at the waterfront. There were amazing antique and vintage dealers there at the time and I stated to buy lengths of brocades, velvets and embroideries that I would wear in my hair. During school holidays I’d take myself to London to spend my pocket money and on the number 19 bus I met a moustachioed lady who told me I looked like a young Edith Sitwell. This lady asked me if she could paint my portrait as she adored my turban, I later found out this lady was the artist, Maggie Hambling. Reading about Edith Sitwell and her circle lead me on to other artists, freethinkers and poets. I started to read about Gustav Klimt, Josef Hoffmann, Emilie Flöge, Egon Schiele and Dagobert Peche. GB Do you think the stand has a timeless appeal? And do you take its presence for granted now you own it? CC I am not sure who designed the piece, but to me it feels very Koloman Moser. For me, his work is still shocking and sumptuous in its modernity. His aesthetic was one of formal reduction, sublime craftsmanship and a precise balance of form and colour. I love that I have this piece in my home. I find it so energising and inspiring. 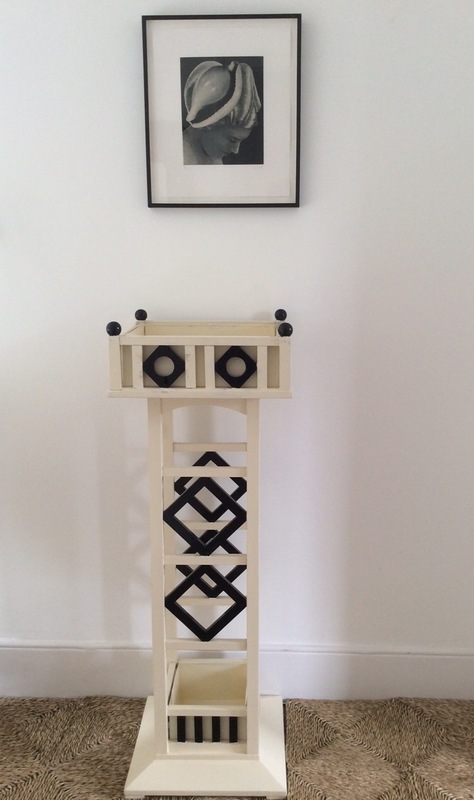 Koloman Moser would have gone to so much trouble to make something as whimsical as a flower stand, an object with so much austerity yet frivolity. GB If IKEA ripped off the design, could you still see beauty in their chipboard version? How important is authenticity? CC I’ve only been to IKEA once and the only thing that was enjoyable were the meatballs in the café at the end! Authenticity is key. For me, it was an absolute train of thought and vibration of what was happening in Vienna at the time that inspired such a clash of craft, making, rigour and unorthodoxy. Hoffmann said ‘handcraft strived to achieve an identical goal within any nation: to impart appropriate form to modern perception’. GB The Secessionists were fighting against Historicism. Do you think that they still wanted to create beauty as well as striking originality? CC The Secessionists were consumed by their pursuit of originality and beauty. In the architecture of Adolf Loos, Hoffmann etc the repetition of surface pattern and rhythm of motif reinforced the Secessionist message. Notable at the Palais Stoclet and the Knips apartment with their rows of plant pots and geometric grid patterns. On a tangent to the rigour of Adolf Loos, Dagobert Peche created capricious arrangements that marked a dramatic return to the overtly decorative. His floral forms are constantly in movement suggesting endless transformation and evolution. He adored abundant floral shapes and William Morris-like spiky leaves. Hoffmann and Moser created the concept of the Gesamtkunstwerk, their idea of the environment being a total work of art. GB Is your love for this style a sort of neo-Historicism too, reacting against contemporary arts? CC No. For me there is an absolute parallel between contemporary art now, and the pattern, creation and all consuming way way that the Secessionists worked. Recently I’ve discovered the work of Eric Bainbridge. As well as his fake fur sculpture installations and his oversized towel rails, he creates the most extraordinary photographic paper collages; dismembered, abstracted portraits culled from magazine pages. There is a calm and sophistication, an exquisite sense of balance in his colours and textures. For me it feels similar to the way that Klimt or Marie Louise Von Motesiczky approached portraiture in their work there was an austere and formalised reduction of colour, detail, a precise balance of form and tone. Seeing Isa Genzkens Vienna show last summer with her clothing rags, holographic plastics and fluo paint, gave me the same emotional electric shock as when I visited Emilie Flöge’s atelier in Vienna at the age of 16. Last summer at the painting studio of Gustav Klimt, I was over the moon to see that he painted his Secession masterpieces adjacent to a wall of crittall windows. I adore surprises like that. It reminded me of an interview with Francis Bacon where he said as a young man he had Oscar Wilde’s telephone number. GB What are the main impulses behind your own design work? Is beauty or style more important? CC My main impulses are research, craft and the make. I adore using a ‘poor’ material and turning it into something sumptuous and opulent through the fabrication. Recently I was working with a flint knapper to create a jewelled table. I created floral clusters of field flints in gold vermeil clasp settings. For me, luxury is chicer and more relevant with a ‘poor’ hand, I love sumptuous but not ostentatious things. Research and rummaging is an absolute non-negotiable in the way I work. At the age of five, my parents let me join a Roman archaeological dig where a kindly and obviously patient archaeologist let me spend the day with a teaspoon and tea strainer and a badger hairbrush digging in the mud. As an adult now I think it was so adorable that he indulged my childish ego and set me on this path of lifelong curiosity. CC I never know until I see it. Then I get butterflies. It can be something as simple as a view from a train or a podgy teenager on X Factor receiving a round of applause, a celluloid crown made for a Nijinsky ballet by Naum Gabo or the corn dolly hanging from the ceiling at the Leach pottery.